Or is it hoo-hoo? Or maybe trilllll and whinny in the early morning hours? No, it’s relief on my part, so it’s a big yay! An Eastern Screech-Owl, Megascops asio, snoozes in the box early this morning. This owl watching season has been an odd one, with this enigmatic bird more than discreet than usual. I’ve only heard screech song three times this winter, and until this morning, hadn’t a single glimpse of the shy little raptors. But here she is! Is she exhibiting her nesting behaviors, perhaps? I certainly hope so! Update: the nest box camera position didn’t capture any part of her owl body as she was hanging out this morning and she didn’t snuggle in for her daytime rest until I published, but here she is, boxed in for the day. 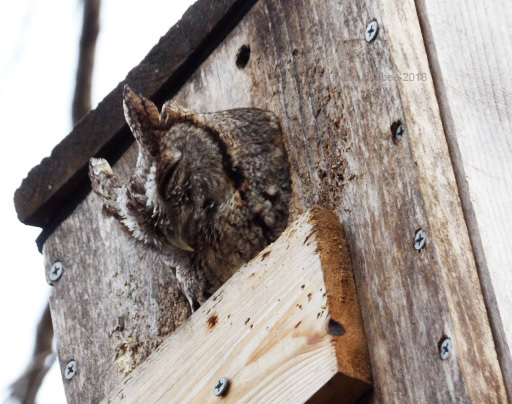 This entry was posted in Eastern Screech Owl House, Eastern Screech Owls, Megascops asio, Uncategorized and tagged Back yard birding, Biodiversity by Tina. Bookmark the permalink. How wonderful, Tina. Now, you need to post a “No Possums Allowed” sign! Haha! You know, we haven’t had an oppossum around in months. I’m sure some are trundling through, but no one has bee in the nest box–no oppossum, no squirrel, no owl–until this morning! Congratulations Tina. 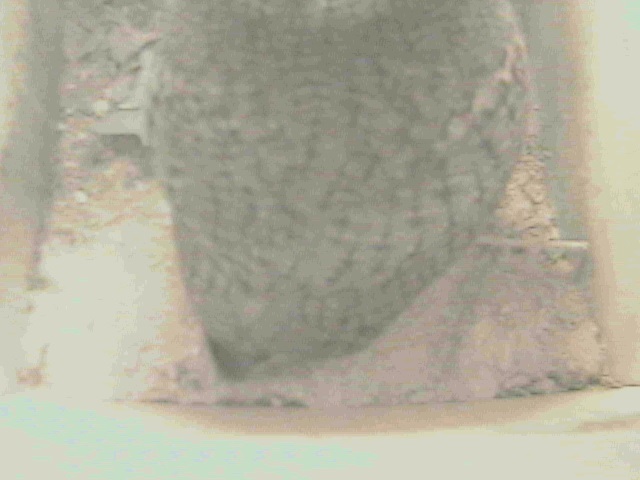 Finally, a female Oriental howler owl has gotten into the nest box this year. And he has curled up! Wonderful! As it looks good with the camera inside the box. I hope he grows this year. Woo-Hoo! Have a great time watching the oriental howler owl. Please, Tina, please be kind enough to continue reporting the owl if it stays, which I’m sure will stay. Thank you so much for everything. Greetings from Margarita. Thank, Margarita. You can be sure that I’ll keep my readers up on what’s happening with the owls. I hope they’ll be able to raise their family this spring. Yay! That is very exciting. I’ll look forward to your updates through the nesting time. They are such awesome, beneficial birds. Cheers! It is! I saw her leave this evening, but there was no mate around. But I’ll keep you posted! Nope, not stuck. Just dreaming about that next, succulent rat. I’m glad your owl is back. I’m looking forward to more photos. Ha! She was there, but not today! Owls are fickle! Hurray … what a relief! Well, she hasn’t been in the box for the last two days, so I hope my glee wasn’t premature.